8. Are AAC facilities accredited? 9. Why is accreditation important for a treatment facility? 13. Will my child or loved one have a greater chance at recovery by attending an accredited facility? Individuals seeking treatment for alcohol or drug abuse are bombarded by hundreds of online ads promising miracle addiction treatments, rapid detox services, and unbelievable promises of easy alcohol and substance addiction cures. Overnight, some programs claim they can magically heal your addicted loved one. You might find yourself wondering what really works? What programs are exaggerated or the latest fad without sound research behind it? The safety of our loved one is too important to entrust them to facilities we know nothing about. With so many options for treatment programs in the growing industry of addiction treatment, how can you identify a rehabilitation program that will provide the quality care your loved one needs to address their specific addiction issues? How can I know if an addiction treatment center provides the best standards of care for my family member? When my loved one agrees to enter treatment – which facility is the best choice? Where can I find a substance abuse treatment program that is acknowledged by industry professionals as a legitimate and effective rehab option? Is there a facility with licensed, credentialed professionals who have experience in substance use disorders? A way to ensure your loved one’s substance abuse program will provide the appropriate, tailored care is to choose an accredited facility. Many addiction and mental health treatment programs undergo the process of accreditation in addition to state licensure requirements. When an addiction treatment program is “accredited,” this means that the facility has gone through a series of evaluations in its pursuit to reach standards of excellence in client care. The process of accreditation is a lengthy process whereby programs and therapy practices are objectively evaluated in comparison with the CARF or Joint Commission standards. In seeking accreditation, the addiction programs and therapies are evaluated by an industry-respected third-party accrediting body. Once the program has earned the seal of accreditation and recognition, clients can rest easy in knowing they have been assessed by the most respected organizations in addiction and mental health treatment. When you or your family member arrive at an accredited treatment facility, there should be a sense of confidence that the program will treat your loved one with the dignity and respect, and that he or she will receive thoughtful personalized programming. Accredited programs are held to higher standards of care than many state licensing requirements. Programs with accreditation treat their clients using best practices in addiction therapy practices. When a facility is in the process of seeking accreditation or has earned accreditation, this indicates their dedication, desire, and commitment for continual improvement of service delivery for clients. During the months-long preparation and accreditation process, the facility and staff opens its doors for the accrediting bodies for onsite visits and evaluations. During the process, a number of practices are evaluated at the facility visits looking at all components of the facility’s management, policies and procedures, safety plans, client residential areas, treatment areas and equipment, programming schedules, and therapies. The safety of your loved one is a big reason that facilities strive for the seal of CARF or Joint Commission accreditation. When selecting a facility to treat a family member with the life-threatening disease of addiction, it’s difficult to know which centers have programs that were designed using research-based rehabilitation techniques and executed by a staff of professionals whose credentials meet the guidelines as defined by the accrediting bodies. Accreditation can be a sometimes lengthy process involving a comprehensive review focusing on a program’s delivery of treatment services. This includes how the organization operates on a daily basis, the clinical services offered, staffing, training, and effectiveness of programs. When a facility is accredited by CARF, it signifies that the program meets their internationally recognized quality standards, and it dedicated to individualized care and client satisfaction.Facilities that earn accreditation meet internationally accepted standards of quality and are committed to individualized treatment and client satisfaction1. 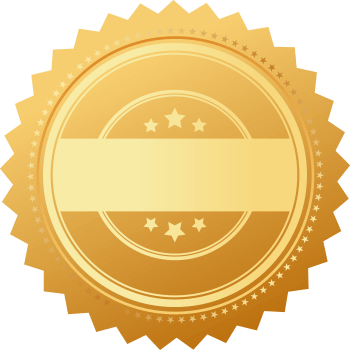 If accreditation is valued by alcohol and drug rehab clients, why don’t all facilities become accredited? It’s not that easy for a number of reasons. Accreditation is an intensive process that takes time, money, and an examination of the program’s operations, client care, staff, safety programs, and policies. Accredited programs have demonstrated a dedication to helping clients using therapeutic interventions that meet elevated levels of treatment standards accepted by international accrediting bodies. The fact that a program or facility has earned accreditation is a quality differentiator and indication that the facility is striving for excellence in providing best practices in addiction therapy for its clients. 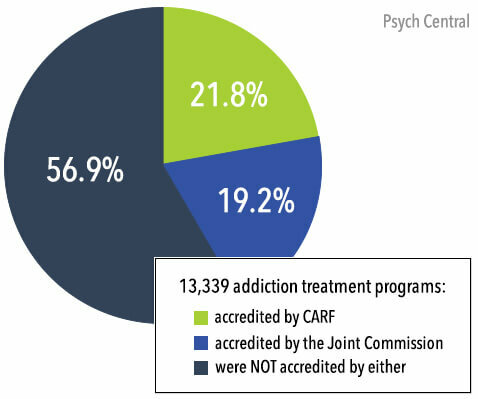 The two most prominent accrediting organizations for addiction rehabilitation programs are the Commission on Accreditation of Rehabilitation Facilities (CARF) and the Joint Commission, previously known as JCAHO. For this reason, the majority of addiction programs seek accreditation from these two groups for their unparalleled industry standards in rehabilitation from substance use disorders. For addiction rehabilitation, CARF is a non-profit accreditation body that evaluates substance abuse and dual diagnosis programs. As the largest U.S. accrediting organization for addiction facilities, Facilites that meet CARF-defined standards of care have attained the industry benchmark for quality programming. 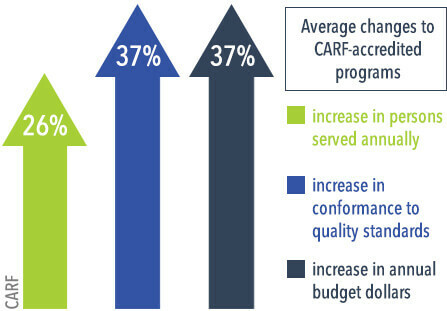 In addition to growing the number of accreditation programs, CARF has also quadrupled the number of behavioral health services it accredits to about 31 percent of all such accredited services3. CARF accredits an extensive variety of programs including assistive technology for employment, child and youth community programs, respite services; addiction case management, prevention and residential programs, and numerous mental health and psychosocial rehabilitation programs4. Growing Prominence: According to John Corrigan, PhD, the American Psychological Association (APA)’s former liaison for CARF accreditation, CARF has increased its role in setting high standards of care for in other service delivery program. While CARF has been the leader in healthcare and vocational rehabilitation programs, its scope now has expanded to include accreditation programs for a diverse number of healthcare, vocational, and other community programs. By setting accreditation standards for a spectrum of community programs aimed at breaking the cycles of unemployment, adult day-care, and assisted living facilities5. One of the other major players in addiction program accreditation is the Joint Commission, the nation’s largest accrediting body for hospitals and medical facilities. Formerly known as JCAHO, the Joint Commission is also the second largest accrediting organization for addiction rehabilitation programs in the U.S. Many types of healthcare providers can earn accreditation from the Joint Commission, which has accredited more than 20,000 healthcare programs and providers. These include home health care providers, physicians practices, mental health treatment facilities, assisted living and nursing facilities, and large hospitals6. Healthcare organizations with Joint Commission accreditation can certify associated or internal programs within the organization. Accreditation is not limited to facilities that provide addiction and mental health treatment. There are accreditation standards for hospitals, urgent care centers, freestanding medical clinics, community health centers, and other areas of care. Some of these programs go through the accreditation process through organizations such as the Healthcare Facilities Accreditation Program (HFAP), which is a nationally recognized accreditation organization with deeming authority from Centers for Medicare & Medicaid Services (CMS), which covers 100 million people8. Yes. All of our facilities are accredited by CARF or the Joint Commission because of our strong desire to help individuals turn their lives around after struggling with alcohol and drug addiction. We want to provide effective, research-based addition therapies that meet the highest industry standards. How do I get admission into a facility with research-based therapy? How do I know which programs I see online will provide safe and quality care? How can I find a program with addiction industry accreditation? Selecting an addiction treatment program with CARF of Joint Commission accreditation indicates your concern about the quality, safety, high standards, and therapies based in research. Accredited facilities can assure you of its desire to offer your loved ones excellence in addiction treatment options. The process of accreditation objectively evaluates the facility to determine the treatment areas and therapy practices that meet the standards of the accrediting body, and those service areas that require improvement. An accredited facility lets you know that the facility’s treatment staff and addiction professionals are dedicated to pursuing excellence in their treatment programs using research-based practices and therapies that meet nationally recognized standards and best practices in addiction medicine. Accreditation is not a one-time accomplishment, but rather a continuous process of staying up to date with the latest findings in addiction medicine, new research-based interventions, and findings in treatment outcomes. Facilities must re-new their certifications every 1 to 3 years, based on their accredidation status. For example, CARF accreditations are decided according to differing standards and designations. Accreditation designations are given based on the findings during the accreditation process, and upon the evaluation of the treatment services as defined by CARF. Facilities are awarded accreditation levels based on the features if their programs meeting requirements of the care standard. All individual insurance plans are different, but recognition as an accredited treatment facility illustrates the facility’s dedication to patient care at the highest levels, commitment to quality, and commitment to providing a safe, therapeutic environment for the patient to begin his or her recovery. CARF-accredited service providers that meet specific underwriting guidelines are considered lower risks, in part because their addiction treatment care conforms to CARF standards relating to risk management, health and safety, corporate compliance, and business practices. 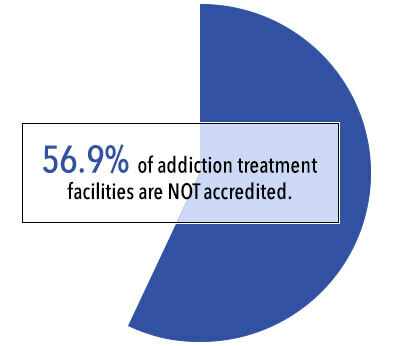 According to recent studies, 56.9% of addiction treatment facilities are NOT accredited.Is treatment at an accredited facility really better than treatment at a non-accredited facility? There are addiction treatment facilities that are not accredited but operate as treatment facilities. Since the reason for lack of accreditation is not known to individuals seeking addiction and co-occurring treatment for themselves or loved ones, it’s difficult to quantify or compare the services provided. Accreditation can be an expensive and laborious process for smaller treatment centers to undergo. Additionally, their staffing and program capacity may not support accredited programs. Success in alcohol and drug treatment can depend on so many variables, ranging from your loved one’s unique addiction history, the presence of a co-occurring mental health disorder, chronic health conditions, trauma exposure, and a number of other factors, including motivation. While attending a treatment program in an accredited facility does not guarantee long-term recovery – this is a lifelong journey and up to the individual – accredited programs and research-based therapies does guarantee that the your loved one receives the highest standard in addiction treatment care from a program that has met defined standards of excellence and high quality. “Psychology gains more power on key accrediting body.”(2001). American Psychological Association. Accessed July 18, 2016. “What Does Drug Rehab Accreditation Really Mean?”(2015). Psych Central. Accessed July 18, 2016. “Facts about scoring and accreditation decisions.”(2015). The Joint Commission. Accessed July 18, 2016. “Insurance premium savings.”(2016). CARF International. Accessed July 18, 2016. New accreditation standards take effect Jan. 1, 2014”(2013). Practice Central. Accessed July 18, 2016.